Why are there so many? How do they differ? Does it matter? 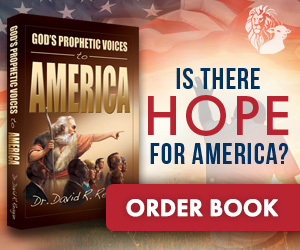 I almost gave up studying Bible prophecy the very first week I started. I was turned off by the vocabulary. I kept running across terms like premillennial, amillennial, and postmillennial. It sounded to me like much of prophecy was written in tongues! Thankfully, the Holy Spirit encouraged me to stick with the task, and before long I began to realize that the terms really were not all that difficult to understand. Basically, there are four major end time viewpoints. Or, to put it another way, there are four different interpretations about what the Bible says concerning end time events. The oldest viewpoint is called historic premillennialism. It is termed “historic” for two reasons: to differentiate it from modern premillennialism and to indicate that it was the historic position of the early Church. It is called “premillennial” because it envisions a return of Jesus to earth before (pre) the beginning of the Millennium. The word, millennium, is a combination of two Latin words mille annum which simply means one thousand years. A diagram of this viewpoint is presented below. It divides the future of the world into four periods: 1) the current Church Age; 2) a seven year period called the Tribulation; 3) a reign of Christ on earth lasting one thousand years (the Millennium); and 4) the Eternal State when the redeemed will dwell forever with God on a new earth. This view is based on a literal interpretation of what the Bible says will happen in the end times. One of its distinctive features is that it places the Rapture of the Church at the end of the Tribulation. According to this view, the Church will remain on earth during the Tribulation. At the end of that period, Jesus will appear in the heavens and the Church will be caught up to meet Him in the sky. The saints will be instantly glorified, and then they will immediately return to the earth to reign with Jesus for a thousand years. 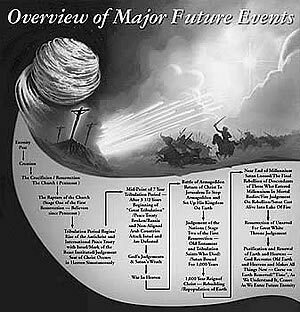 This is the only view of end time events that existed during the first 300 years of the Church. With one exception, all the Church Fathers who expressed themselves on the topic of prophecy were premillennial until A.D. 400. Justin Martyr, who was born in A.D. 100, went so far in his writings on the subject as to suggest that anyone with a different viewpoint was heretical. Those today who disagree with this view respond to the near unanimity of the early Church Fathers by saying they were simply wrong in their interpretation of the prophetic Scriptures. It certainly should be noted that these early church leaders were not prophetic scholars. They wrote very little on prophecy, and what they wrote was sketchy. Their main concern was not prophecy, but the deity of Jesus, the oneness of God, the practical problems of church organization, and survival amidst persecution. 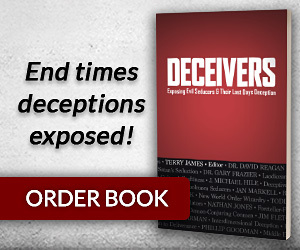 Yet their concept of end time events should not be dismissed out of hand as crude and primitive, for anyone who has studied the prophetic Scriptures will have to admit that the Church Fathers’ viewpoint presents a plain sense summary of the Bible’s teachings about the end times. The one exception to the consensus opinion among the early Church Fathers was Origen (185-254 A.D.). Origen’s approach to all of Scripture was to spiritualize it. He therefore denied the literal meaning of prophecy. He looked upon its language as highly symbolic and expressive of deep spiritual truths rather than of future historical events. Although Origen could not accept the premillennial viewpoint, he did not develop an alternative. That task fell to the Church Father named St. Augustine (358-434 A.D.) who ultimately had the greatest impact on the development of church doctrine. He conceived an alternative viewpoint at the end of the fourth century. The term is misleading, however, because most amillennialists do believe in a millennium, but not a literal, earthly one. They argue that the Millennium is the current spiritual reign of Christ over the Church and that it will continue until He returns for His saints. They thus interpret the thousand years as a symbolic period of time. One appealing aspect of the amillennial view is its simplicity. The Church Age comes to a screaming halt as a result of the Rapture of the Church. There is no Tribulation, no literal earthly Millennium, and no eternity on a new earth. Augustine spiritualized everything, arguing that the kingdom is the Church, the Millennium is the current Church Age, and the new earth is symbolic language for Heaven. Augustine’s view of end time events was adopted by the Council of Ephesus in 431 A.D. and has remained Catholic dogma to this day. It is also the current majority viewpoint among mainline Protestant denominations. In other words, the amillennial viewpoint is the one that is held today by the vast majority of all those who profess to be Christians. 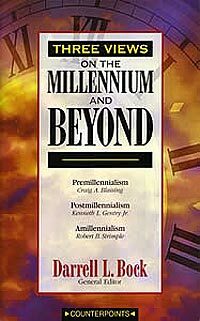 The third view of end time events, called post-millennialism, did not develop until the mid-seventeenth century, long after the Reformation. 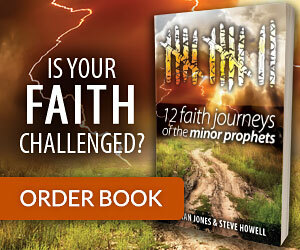 The Reformation had little impact on prophetic views because the Reformation leaders had their attention riveted on the questions of Biblical authority and justification by faith. The postmillennial view was a product of the rationalistic revolution in thinking. It was developed in the mid-1600’s by a Unitarian minister named Daniel Whitby. It was immediately dubbed “postmillennialism” because it envisioned a return of Jesus after (post) a literal thousand year reign of the Church over all the earth. This view is illustrated below. Postmillennialism spread quickly within the Protestant world, probably for two reasons. First, it gave Protestants an opportunity to differ from the Catholic position. More importantly, it was a theological expression of the prevailing rationalistic philosophy of the age, a philosophy that boldly proclaimed the ability of mankind to build the kingdom of heaven on earth. The postmillennial view holds that the Church Age will gradually evolve into a “golden age” when the Church will rule over all the world. This will be accomplished through the Christianization of the nations. 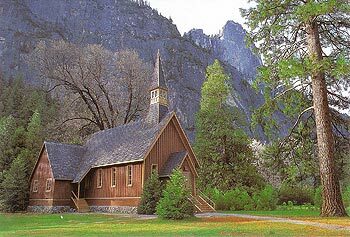 To its credit, it can be said that this viewpoint served as a mighty stimulus to missionary efforts during the eighteenth and nineteenth centuries. Missionaries were seized with the vision of speeding up the return of the Lord by preaching the gospel to all the world. By 1900 nearly all segments of Protestant Christianity had adopted the postmillennial viewpoint. But the view was to be quickly dropped. Postmillennialism died almost overnight with the outbreak of the First World War. The reason, of course, is that this great war undermined one of the fundamental assumptions of the postmillennial viewpoint the assumption of the inevitability of progress. This had always been a fatal flaw in the postmillennial concept, due mainly to its birth in rationalistic humanism. Its visions of the perfectibility of man and the redemption of society were destroyed by the atrocities of the war. Another fatal flaw of the postmillennial viewpoint was its lack of a consistent Biblical base. To expound the view, it was necessary to literalize some prophecies (those concerning the Millennium) while at the same time spiritualizing other prophecies (the personal presence of the Lord during the Millennium). Also, it was necessary to ignore or explain away the many prophecies in the Bible that clearly state that society is going to get worse rather than better as the time approaches for the Lord’s return (Matthew 24:4-24 and 2 Timothy 3:1-5). The sudden death of postmillennialism left a prophetic vacuum among Protestant groups. Since the postmillennial view was based to a large extent upon a spiritualizing approach to Scripture, most Protestant groups returned to the spiritualized amillennial viewpoint they had abandoned in the 1700’s. However, a new choice of prophetic viewpoint presented itself on the American scene about this same time, and some of the more fundamentalist Protestant groups opted for it. 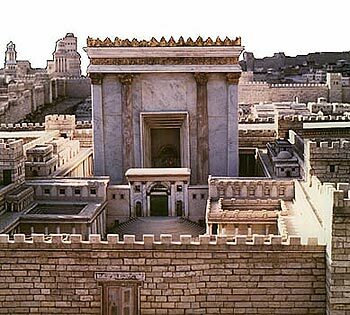 This view was technically called “dispensational premillennialism” because it originated with a group who had been nicknamed “Dispensationalists.” I call it the modern premillennial viewpoint. The modern premillennial viewpoint crystallized in the early 1800’s among a group in England known as the Plymouth Brethren. The view is illustrated below. 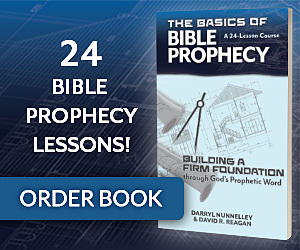 This viewpoint has been attacked as being “too new to be true.” But its advocates are quick to point out that the Bible teaches the principle of “progressive illumination” regarding prophecy (Daniel 12:4 and Jeremiah 30:24). What they mean by this is that the Bible itself indicates that end time prophecy will be better understood as the time nears for its fulfillment. Looking back over these four views of the end times, we can see some significant differences. But let’s not overlook the similarities. All agree that Jesus is coming back for His saints. All agree that the redeemed will spend eternity in the presence of God. These two points of agreement are far more important than the many points of disagreement. Still, the areas of disagreement are significant. Two of the views (the amillennial and postmillennial) deny that Jesus will ever manifest His glory before the nations in a world wide reign of peace, justice and righteousness. The postmillennial view also denies the soon coming of the Lord, for according to this view, the Lord cannot return until His Church has ruled over the world for a thousand years. The key to the differences is the approach to Scripture. If you tend to spiritualize Scripture, you will end up with an amillennial or postmillennial viewpoint. If you tend to accept Scripture for its plain sense meaning, you will have a premillennial viewpoint. I urge you to accept the plain sense meaning of Scripture. Don’t play games with God’s Word by spiritualizing it. When you do so, you can make it mean whatever you want it to mean, but in the process you will lose the true meaning that God intended. Remember, the First Coming prophecies meant what they said. That should be our guide for interpreting the prophecies of the Second Coming.